this came up on another forum, but i thought many people are confused about how well using a tablet/phone for a GPS works, so i should re-post here. most of the confusion comes from which mapping app to get and what limitations are there..
i'm currently using a Motorola Xoom 10". it has completely replaced my previous Garmin dedicated GPS. i have not found the need for an external GPS receiver for it, the internal one is accurate and works well overall. i have not yet tried an external HD for map storage, but that is the eventual plan... it has 32GB of internal storage and supports up to 64GB removable MicroSD cards which has been sufficient so far. - i currently use BackCountry Navigator PRO GPS for my offroad/topo maps. i had asked the developer to fix it crashing when trying to download an entire state at Zoom Level 16 (OSM map types). he responded by saying that it wasn't designed for that and then issued a statement in the help/FAQ to that effect, and then finally updated the app to make selecting an entire state for download at that level of detail impossible. however, despite his unwillingness to help, i still find the app to work with larger datasets better than others. -- the most important feature of BCN is that it allows you to store maps on the external card, and it does a decent job of allowing you to define multiple map databases. some software (like most Trimble products) do no allow you to put maps on the external storage, thus limiting you to the internal storage which is shared by the OS and all other apps. -- by doing chunks at a time, i have managed to download my home state to zoom level 15 (Open Cycle Map). this gives me a *decent* trails type map for spur of the moment runs. -- for trips where i can plan ahead, i download the Open Cycle Map to zoom level 16, a 24k Topo Map to zoom level 16, and an Aerial map to zoom level 16 or 17. depending on the size of the area the trip is in, this could take from just a few hours to all day to completely download. -- importing .gpx track/waypoints is easy, as well as exporting. i still do my trip planning in a combination of Garmin BaseCamp and Google Earth on the desktop computer. there are no current Android apps that offer topo/trail maps in a smaller vector format, they all use raster image tiles. this means that each zoom level is exponentially larger than the previous, so it's easy to chew up GB's. hopefully Garmin, Delorme, or National Geographic will eventually release their vector based topo maps in Android app form. side note, Orux Maps is free (or donation based), and is far superior to Back Country Navigator in many respects. however, i found the 500MB limit per map database quickly created an unmanageable list of saved maps, so i'm not currently using it. someone mentioned that you can change this limit, please let me know how if you see this. i believe Motion X is still the top dog for trail/topo mapping on that platform. also i see that many people run an external GPS receiver when using an iPad. i'm not sure if that's just because the earlier WiFi-only models lacked a GPS chip, or if even the current one's perform much better with an external device. if you hate fiddling with computers in general, i still recommend a dedicated GPS unit like the Garmin Montana for simplicity. but if you can deal with just a bit more technology interaction, a tablet/phone based GPS is superior in many respects. Last edited by theksmith; 04-05-2017 at 12:22 PM. I don't use it much, but when I use my phone for GPS, I still use Motion X. It does everything I've ever asked it to do, including precaching as large an area as I want it to, at whatever resolution the iDevice is capable of storing (dependent on storage space). It's a great application, and I highly recommend it. To confirm theksmith's suspicion, the original WiFi only iPad did not have GPS capability, thus the purchase of external third party GPS units. I haven't tried any of them, but I hear both USB and Bluetooth connected models were very reliable. I use MotionX-GPS HD on an iPad, but no longer recommend it. In earlier versions, it allowed downloading Bing satellite maps for use when in the backcountry. They discontinued that feature with no warning, providing an "upgrade" that severely crippled the map downloads. I was fortunate enough to be able to roll back to the previous version, but many other folks couldn't. So it continues to work fine for me, but anyone just starting out will probably be unhappy when they realize the limitations. I'm also experimenting with "PDF Maps" on the iPad for topo maps and for the ability to load and orient custom maps. Don't have anything meaningful to say about it yet. I use a 64GB Ipad 2 with the 3G service capability. I never use the 3G, but only iPads with that chip have built-in GPS (as UnderlyVerbose noted). I started with a 16GB iPad, but that's not nearly enough room for downloading detailed satellite images for all the areas of Arizona I like to explore. So far 64GB has been adequate and allows room for music and movies. You can control the space usage by not storing maps at higher detail levels, but I usually download segments from level 11 to level 18 so that I can zoom out reasonably and zoom way in for a look at interesting ground features. For satellite images, I feel level 17 is the bare minimum for showing reasonable detail. 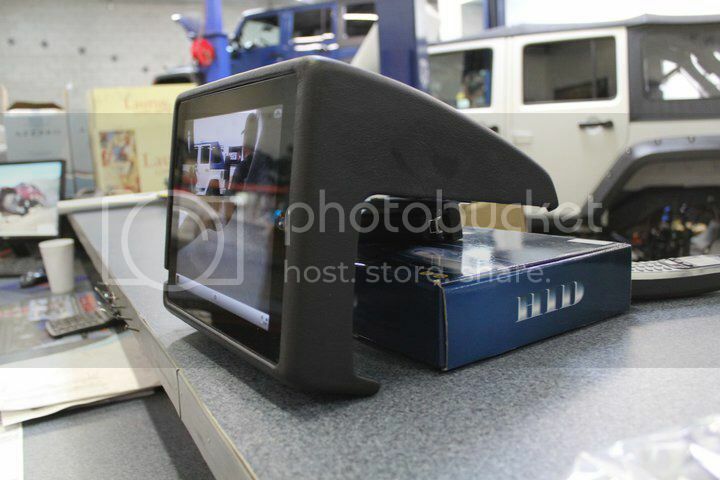 I use a RAM mount with a cup-holder adapter for the iPad when off road. If I shut off the display when not needing to view it, the iPad will easily record a whole day's worth of travel. (It continues to record even when display is off.) If you like to watch it the whole time, the display will drain the battery, so you'll need a charging cable to keep it going. I opted for a iPad 2 64GB 3G (Verizon) to save on the initial investment. I only use the iPad for couch surfing and in car navigation. 3G allows for GPS without WIFI. Ram mount mounted to 1 1/4" x 1 1/4" square tubing (Lowe's) The holes allowed me to 'assemble' without the need to weld. Square tubing doubled up to allow the arm more articulation. I chose the generic Ram mount for the iPad as I utilize a Otterbox Commuter series case. Setup is solid, very little movement offroad, easy to adjust and allows multiple viewing angles for driver or passenger alike. Mount also folds flush if iPad is not in use. Apps installed are MotionX, Gaia GPS, CoPilot Live, MyTopo Pro. MotionX is a fantastic app (recent IOS changes make this less stellar.) The only issue is downloading maps via WIFI. I've had downloads take 5-6 days for bigger files 1.5GB. I wish you could download to your computer and then upload to the iPad. Gaia GPS has become my default navigation app. I use my iPhone as a hot spot when I have cell coverage to cache maps, but I still have downloaded about 20gb worth of hybrid and TOPO maps on to the device. The zoom settings I use are 10-16. Charging is done by a 2.1amp USB charger added into a (always hot) 12v source next to the glove box. i never did evaluate Gaia on Android, it didn't look as good as some of the others at the time... i wonder how different it is on iOS. why have you switched to it over MotionX? MotionX lost Google maps with IOS6. Gaia has added some new map layers and other features that make it my favorite for now. Downloads are much faster as well. I also switched from Delorme Topo on an UMPC to Gaia GPS on my Ipad. It runs absolutely fine and as Mark mentiioned, the map download is very fast. It only had problems once, when the tracklog gets to big (like the Lockhart Basin trip, we did in september, which was a two day tracklog). Everything else runs great for me. What I personally can not recommend, is the Padholdr mount, which I modified to use it with a rammount holder for the ipad. After the OPP september trip it was already broken. I now tend to use the Carolina Metal Masters JK grab handle, which has a rammount connector. This should be bulletproof for a JK. I find this thread most interesting as I am now starting to research out if using a iPad gen 4 would be a good solution to replacing my Toughbook. I like the idea of using the Carolina Metal Masters JK grab handle, which has a rammount connector. Looks like this is a good solution for getting the computer off the passenger seat and more at eye level. How does this setup work with a passenger in the seat? Does the location of the iPad on the mount cause the passenger a danger being too close to their knees, face, etc.? How do you keep tracking/plotting your GPS location when you do not have cell towers or internet connect? Is this where the lightening connection on the back of the iPad can be used to feed in a GPS signal like I do with my USB connection to the Toughbook? I use a Garmin GPSmap 60CSx as my GPS receiver. I am using now the JK Grab Bar Handle from Carolina Metal Masters with my IPad 4. For the passenger, the Rammount holder is pretty close to the leg in my configuration, but it was never a problem for my wife. But there might be a possibility to hit the holder with the leg while being on a trail. I am running GAIA GPS and this works fine with the inbuilt GPS unit of the IPAD. For me, no external GPS is necessary. It was also running fine with my IPAD 3 with inbuilt GPS.